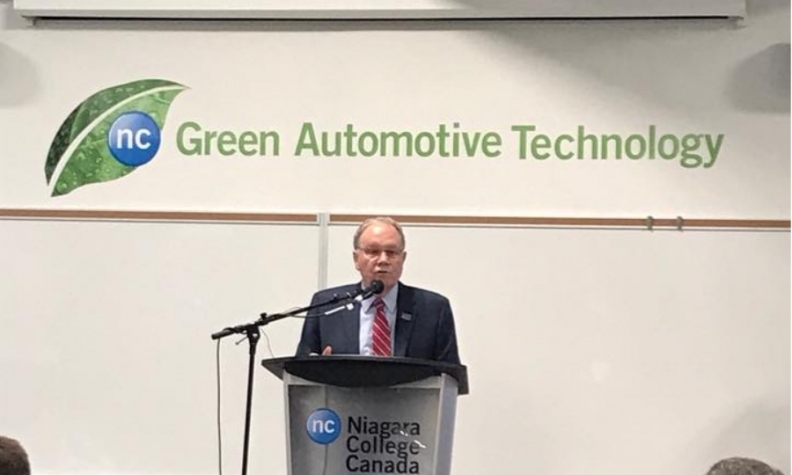 Niagara College President Dan Patterson opens the Green Automotive Technology Lab. Niagara College now has a automotive lab dedicated to the research and development of green technology. The school opened the 3,600 square foot (335 square metre) Green Automotive Technology Lab earlier this month. It’s part of the Rankin Technology Centre at Niagara College’s Welland Campus. The new facility includes additional classroom space, electric-vehicle charging stations and hybrid and electric-motor diagnostic and simulation tools. It also houses several donated hybrid and fully electric vehicles that allow students access to technologies that are increasingly in popularity. The lab is also has tools and equipment that will help students explore the future of ethanol, propane, diesel and other alternative fuel technologies, as well as autonomous, self-parking and collision-avoidance technologies. “The cutting-edge technology and forward-thinking facilities in this new lab reflect Niagara College’s pre-emptive approach to applied education, which ensures our graduates are ready for the workplaces not only of today, but of tomorrow as well,” Niagara College President Dan Patterson said in a statement. In 2016, St. Catharines MPP Jim Bradley announced $1.4 million of provincial funding for construction of the lab through Ontario’s Apprenticeship Enhancement Fund program.